Europe’s most popular coin is the Silver Austrian Philharmonic coin. First introduced as a gold bullion coin in 1989, the silver bullion version debuted in 2008 and was met with immediate demand. Mintage grew from 7 million in 2008 to more than 17 million by 2011. Today, mintage continues to grow and the 2016 Silver Austrian Philharmonic coin is now available in perfect condition. Ninth version of the Silver Austrian Philharmonic coin! Ships to you in a protective slab to protect the coin’s condition. Issued a face value of €1.50 (Euros) by the Austrian Mint. Designated an Early Release coin by the NGC. 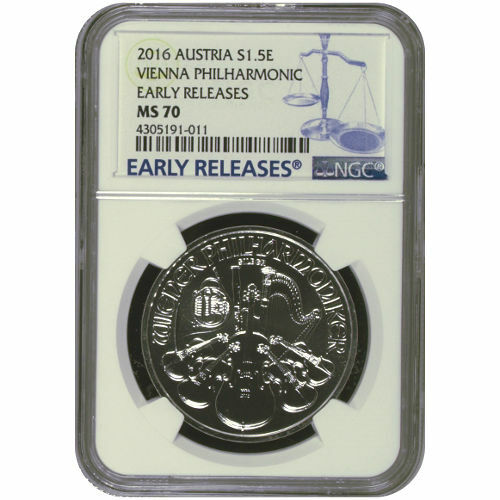 Each 2016 Silver Austrian Philharmonic coin in this listing has a perfect grade from the NGC. Coins in Mint State 70 condition exhibit full, original mint luster and feature no detracting flaws. 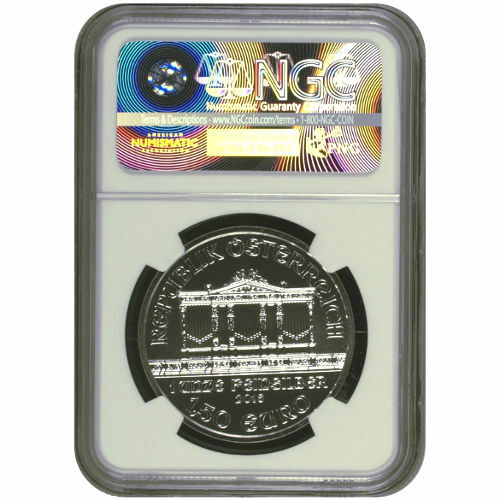 In order to earn the Early Release designation, these coins had to meet NGC standards for delivery. Early Release coins must arrive at the NGC or an NGC-approved depository within 30 days of the release date set by the Austrian Mint. Silver Austrian Philharmonic coins were introduced in 2008. They are available with a face value listed in Euros, but they are not considered legal tender outside of Austria even though they bear the shared currency of the Eurozone nations. On the obverse face of the coin you’ll find an image of the pipe organ from the Golden Music Hall in the Musikverein. The home of the Vienna Philharmonic orchestra is located in the Innere Stadt neighborhood of Vienna. The reverse side of the coin displays numerous instruments used by the members of the Vienna Philharmonic. Instruments such as the French horn, bassoon, harp, and cello are featured in the design. Duke Leopold V founded the Austrian Mint in 1194 using 15 tonnes of silver paid by Richard the Lionheart as ransom. The payment secured passage of Richard’s army through Austria as it returned from the Crusades in the Middle East. Please direct any questions you might have to a Silver.com associate. Our team members are available at 888-989-7223, online using our live web chat, or by sending your questions to us via email.